Vestislav Apostolov received his M.S. degree from University of Sofia in 1994 and his PhD in Mathematics from École Polytechnique (France) in 1997. From 1994 to 2000 he was a junior research fellow at the Institute of Mathematics and Informatics, Bulgarian Academy of Sciences. From 2000 to 2009 he was an associate professor at Université du Québec à Montréal (Canada). He was a visiting professor at Stonny Brook, Simons Center for Geometry and Physics; École Polytechnique (France); École Normale Supérieure; Université d’Aix-Marseille I. At present he is a professor at Université du Québec à Montréal (Canada). 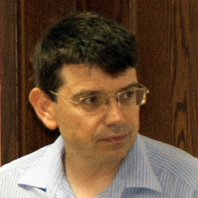 Professor Apostolov’s main research interests are in the field of complex analysis and differential geometry. He has authored and co-authored over 40 research papers and has given numerous plenary and invited lectures in Bulgaria, Canada, France, Italy, Romania, United Kingdom, United States. Vestislav Apostolov was a co-organizer of 3 conferences and a member of the scientific committees of 2 workshops. He is currently a member of the editorial board of the journals “Annals of Global Analysis and Geometry” and “Complex Manifolds”.